Harvester is one of the most famous chain of restaurants in the United Kingdom. They have around 200 outlets across the country and is best known for their flame grilled food, spit-roasted chicken and self-serve salad bars. They also offer gourmet burgers and options for vegetarians. Can;t get the whole gang around a table at Harvester. No worries,mate. Just order online and collect your takeaway when you need it. Could not be simpler. Harvester now provides its guests with free WIFI. Don’t forget to follow Harvester through social media. Below are the latest Harvester menu prices. Their best sellers include the Signature Fish and Chips, or a large serving of sustainably sourced cod fillet in a parsley-infused batter, served with crisp, seasoned fries, tartar sauce and a choice of buttered peas. Barbecue Pulled Pork, Three Bean and Cheese Wrap is Sticky BBQ pulled pork, spicy three bean mix and cheese, with shredded lettuce and tomato in a flour tortilla. It is served with crisp, seasoned fries, and sour cream and chive dip. All these entries can be eaten with unlimited salad and starts at £4.99. 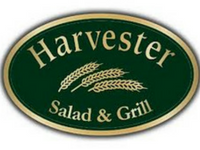 Harvester is well-known for their unlimited salad bar which offers the freshest vegetables. There are 12 vegetable items to choose from, and tasty pasta, coleslaw and potato salad. The salad bar also offers six different dressings and five salad toppers which diners can mix and match to create unlimited combinations.